What Are You Fighting FOR? – Stew Rd. What are you FOR? 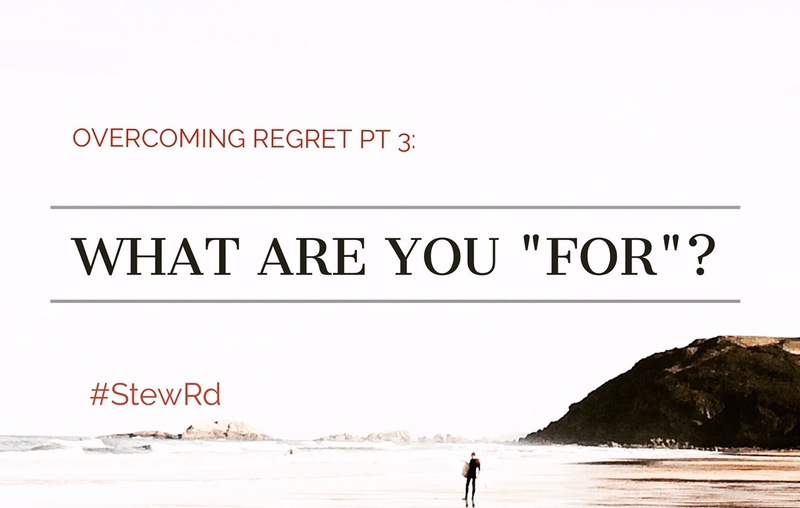 This is part 3 in the Overcoming Regret series. When I was in the process of overcoming regret in regards to seeing my daughter move out of our home for college, I found myself focused on negative things in our lives (what was missing, what was wrong or imperfect, lessons that needed to be learned, etc). I, quickly, had to learn the lesson of celebrating what “is” instead of what was “not”. The next lesson I had to learn was to get better at communicating what I was fighting FOR. These days, it seems everyone has a cause. We are bombarded in the news, social media, editorial columns, politics, religion and the list goes on and on and on. .. It is really easy to find out what someone is against. We can tend to be vocal about what we are against, what bothers us and what we don’t like. If we are not aware that we are doing it, we can take that same attitude and tone with ourselves, our families and with those in our realm of influence. Think about this for a minute, are you more passionate and vocal about what you are for or what you are against? what you are FOR or what you are AGAINST? The answer to that question is crucial to living regret free. Why? Because anger and causes are great temporary motivations but only love is worthy enough to go the distance. Only love builds people up and truly gives them power and motivation for the long haul. If we live focused on what we are against, we never really share with people what is most dear and important to our heart. Being known for who we really are is one of our deepest needs as human beings, fighting is not. Being primarily focused on what we are AGAINST, leads us to try and push people away from something. Focusing on what we are FOR allows us to invite people to something. Imagine if you had a friend or family member on one side of a very large room with furniture and obstacles in it but the lights were off and it was almost impossible to see. Imagine that you knew where the light switch was on the other side of the room and told that person to go turn the lights on. However, you didn’t tell them where the light switch was you just yelled, “NO NOT THAT WAY!” whenever they got close to or hit an object. How effective would that be? How would they have to find the light switch? How would they feel about you by the time they did?? And that is the way many people live their lives. It is sometimes more natural for us to fuss at what we don’t want than give a clear picture of the goal. Human nature does not like to be pushed. The more we push someone, the more they tend to push back. Father God is the best at inviting. He offers us something better, invites us to it and then completely gives us the freedom to walk away. Pushing people by focusing on what we are against can temporarily modify behavior, but it can never motivate long term transformation and direction. What am I hoping for in this situation now and long term? What do I want you to have? What kind of future do I hope for us or you? What are the possibilities in your future if we pursue this goal? Often those who lack vision and purpose the most in their own life, will make attacking others efforts and directions their primary purpose. Why? Because they don’t have enough passion and vision for what they love to occupy and fulfill them so they just attack others who do. They become professional critics pushing others around with guilt trips instead of inspiring people toward worthwhile goals. Not knowing what we are fighting FOR not only leaves us discouraged and frustrated but it is un-motivating for those around us in family, workplace, church, social groups, etc. Do our families, kids or friends know what we’re fighting for in their lives or just what we are against or don’t like? Do they know what God wants to give or just what He prohibits? Does our family or peers know more about what we love or what we hate? Does your spouse know what you want or hope for in the relationship or just what you don’t want or like? Do they know what you celebrate about them or just what you don’t like? Does your team know what you are fighting for or want for them or just what is bad and you don’t like or want? We must get better at teaching how to pursue the prize instead of just run away from trash. Even if you can temporarily motivate people with guilt or anger, it will never have the power for long-term results. Warnings are important, but I want to continue to improve at showing people the Father and His goodness. Counterfeits are much more appealing if people do not have a clear picture of the prize and what the real has to offer! What are you fighting for? What would you pursue and fight for if you weren’t afraid or insecure? Often we get a clue of what people want to fight for when we see what they are fighting against. BREAK IT DOWN and Take it home! Process it some more with some coffee or friends! Have you known someone that is really good at letting you know what they don’t like on a regular basis? How motivating was it to spend time with them? Why do you think it is sometimes easier for people to know and communicate what they are against? Check out Philippians chapter 3 for a great example of someone not only giving a warning but a clear picture of the goal they set out to pursue. What was the prize he was pursuing? Have you ever known someone who made it really clear what they were trying to do and gave you a clear target to hit? Could be work, family, church, etc. If you had to give yourself a 1-5 grade with 5 being the best, how well would you say you are doing at communicating to those around you what you are fighting FOR? Also, on a 1-5 scale, how would you say you do with letting people know when they do hit the mark in order to help them stay motivated? What are the things you are motivated FOR? Take a moment and list 3-5 things you are FOR in your family or your life in general. ACTION Step: Set up a time to talk with family or team about what you are hoping for in that place of influence. This will vary a good bit for different environments or relationships but it is extremely helpful for those around you to know how to hit the target.